Custom fit Drop Forwards are made out of high quality aluminum, which makes them light weight and durable. All drop forwards are 1/4" of an inch thick, 3/4" wide, and can be any length up to one foot. You can also choose the angles of your drop forwards. To learn more about that click on the order page. This allows you to fit your Drop forward perfectly to you! How many other Drop forwards can do that? Custom Fit Drop Forwards can be made to fit ANY hole pattern and ANY hole size! Make sure to specify it on the specs. Drop forwards can either be ordered in black, polish, or left alone for you to do whatever you want to it. Black finish is first sprayed with a primer. After that dries, it is then sprayed with a coat of automotive paint. After that has dried, one coat of clear coat is then applied. Polish is a more durable finish, and looks much nicer too. All polished drop forwards are sanded at 100 grit all the way up to 800 grit, then polished using a high quality aluminum polish. Or you can just leave it blank, for you to do whatever you want to it. 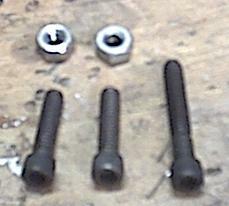 You can also order a set of 3 screws and 2 nuts that will fit perfectly to the drop forward.